Whether by chance or perhaps some broad editorial intent, it’s a curious thing that hip hop culture would be a prominent theme in two currently serialized Kodansha manga in Japan. Change!, running in Monthly Shounen Magazine, is the story of a Japanese poetry-loving girl named Shiori who ends up being drawn into the world of rap battling. Wondance, from Monthly Afternoon, focuses on an athletic boy with a stutter who discovers hip hop dance as a way to express himself. Each series, almost by necessity, takes a very different approach to their respective subjects, and juxtaposing the two highlights the power each work possesses. Change! naturally places great emphasis on verbal dexterity, and as a series about Japanese rapping, there are also certain aspects to the language that make it differ from English. Japanese has fewer vowel sounds, which means that many more things in the language can technically rhyme, which in turn means that the rhymes that do occur can be even more varied yet precise aurally. The heavy emphasis on syllables also gives Japanese a certain sense of rhythm, especially because extending those sounds can change the meaning of a word entirely. All of this needs to be effectively conveyed in the manga, and the approach Change! takes is to place more emphasis on word balloons than most manga. Words and syllables can appear larger or more erratic in order to highlight what key words in one line are being correlated with in the next line. The classic staple of many manga, furigana to aid in the reading of difficult kanji, take on added importance due to both the sheer number of homonyms that exist in Japanese and to make sure the reader keeps track of what’s being said syllable by syllable. 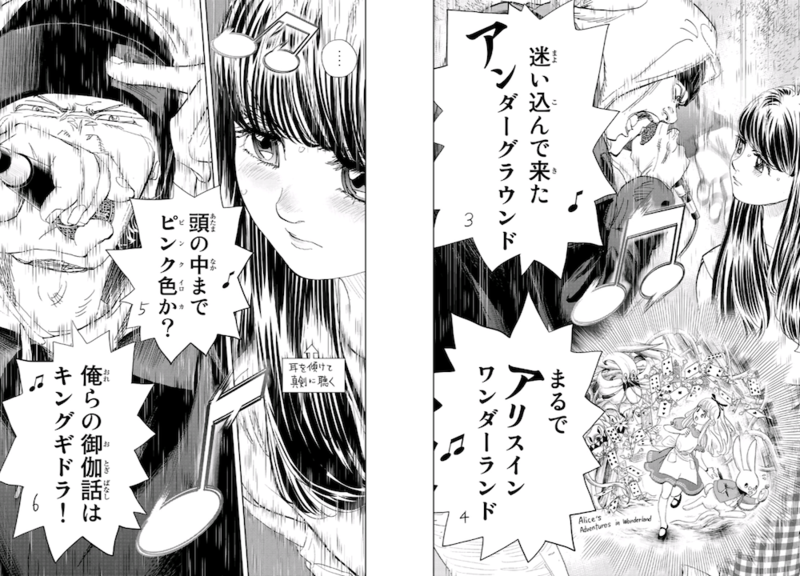 In the images above, the male rapper connects the word “underground” with “Alice in Wonderland,” working off the fact that andaaguraundo and Arisu in Wandaaraando both start with an “a” and have the similar raundo vs. rando. He then follows up on the next page with Atama no naka made pinku iroka? / Orera no otogibanashi wa Kingu Gidora!, or, “Is even the inside of your head the color pink? / Our fairytale is King Ghidorah!” Pinku iroka lines up perfectly vowel-wise with Kingu Gidora, and the talk of fairy tales follows up to his comparison of Shiori as being as out of her depth as Alice is in her story. While the passionate expressions and the metaphorical imagery shown contribute to the atmosphere and to hammer home the meanings behind the words, the actual word balloons do a great deal of heavy lifting. In contrast, although Wondance can be fairly wordy at times, when it comes to dancing, the manga is very much in the “show, don’t tell” category. Characters move with grace and intensity, and panels highlighting their steps litter the pages, turning them into virtual collages that practically crackle with energy. Text is sparse, and primarily brief glimpses into how the characters are thinking in the heat of the moment. In the pages above, the main character and Hikaru—the girl who brings him into the world of dancing—are dancing together in a class. The paneling supports the character artwork, emphasizing a sense of the two as a duo in sync with each other on some deeper level. This visual approach calls to mind the elaborate paneling of 1970s shoujo manga such as Swan, where panels cascade and climax in beautiful ways. The drawings capture not just the dance but the emotions of the dancers as well, making their moves the central vehicle for storytelling. In a sense, one doesn’t even need to know Japanese (or have a translation handy) to get the essence of Wondance. Thus, on the one hand, you have a series where the words are of the utmost importance and another where images hold the power. However, they both draw upon the visual language of comics and especially manga in fundamental ways through their particular emphases. Change! and Wondance capture some of the magic of hip hop culture itself as a multi-medium, multi-angle fusion of various ingredients. This entry was posted in learning japanese, manga, review, thought exercise and tagged change, dance, hip hop, rap, wondance. Bookmark the permalink.